I was born on the Ides of March in 1967. For the two years prior to my birth, my father was stationed in Vietnam, and my mother lived in the Philippines where he visited her on leave. They returned to the United States on a rough crossing of the QE2 just weeks before I was born, settling at the Air Force Base in Dover, Delaware, a place I left at age three and haven’t seen since. Without question, home for me is the South, specifically the Panhandle of Florida, where I spent my school years, and also (more so) New Orleans, not only because I’ve lived here most of my adult life, but also because my roots are here. 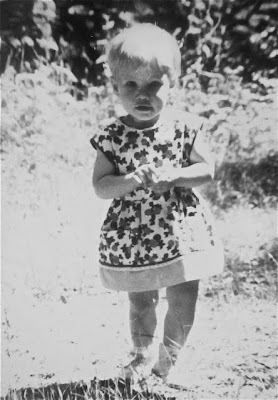 I like walking in the footsteps of my parents and grandparents, and although I’m occasionally mistaken for a California girl, no one’s ever guessed that I took my first breath as a Yankee (although a friend reminds me that Delaware is just South of the Mason-Dixon line). “Julius Caesar bit the dust on my birthday,” I used to say. This connection to Shakespeare and the sign of Pisces suits me just fine and gives me permission to be moody and romantic, trusting and naïve, passionate about the arts, carefree about money, and curious about creativity and spirituality. I attended undergraduate school at Trinity University in San Antonio, where I took a course called ‘Mysticism and Monasticism.’ I was crazy about my professor, a man who never cut his hair, who drove an old VW bus, and who raised llamas and angora rabbits in his back yard. His wife, using a wooden loom, wove his angora sweaters from fur she collected each day after brushing the animals. He was brilliant and introduced me not only to Eastern religions, but also to the more personal and unique spirituality rumbling inside of me but so far squashed from fear of embarrassment. I told my story for the first time (and probably would have spent more evenings sitting atop sand dunes and looking for UFOs with my mother, had I absorbed its lesson). The year before, I lived eight months in Vienna, Austria on a study abroad program. I spent nearly all of my money on a eurail pass, allowing me to jump on trains at any time without buying tickets. My classes centered mostly on European art and particularly Austrian art and architecture. On weekends I sought out the things we studied during the week. 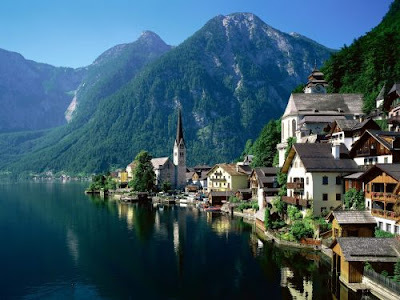 One Friday I took a train to the small town of Hallstatt, Austria, with plans to find the Celtic graves located on the Salt Mountain and dating back to 500 B.C. The whole thing seemed fated from the start. It was early spring, March 14th, the day before my birthday. I got off the train at dusk in a small village on the east side of the Hallstattersea (the lake) and walked, with hopes of finding a youth hostel. A young girl, the only person I saw on the street, passed me on her bicycle, turned around, and asked if I needed help. At her insistence I followed her home, where I stayed with her family. Early on the Ides of March I walked the few miles around the lake to the base of the Salt Mountain, purchased a basket of strawberries and a loaf of bread, and began my climb (the tram wouldn’t run for several weeks yet and besides, it went straight to the visitors center and salt mine tours). Eventually the path became impassable due to melting snow. I knew from class that the graves, although unmarked by any signage, lie somewhere to the left, and so I ventured off the trail and into the woods, continuing upward. At some point, I don’t know when, I slipped and hit my head, awaking hours later in complete darkness, a tree having stopped my fall. There was no moon, and I had no flashlight. No one back home or at school knew I was on this mountain or in this town. Even the family I stayed with would not know where to look for me. It was below freezing, and although I found my bag, my water had fallen from it. I sat up and leaned against the tree on the steep incline. It seems hard to believe now, but I was not afraid (in fact, I don’t even remember being cold). I do distinctly remember thinking about my small person on this huge mountain, possibly sitting at that very moment on top of those ancient graves. I relished my insignificance --- I really did! Although unafraid, I wasn’t particularly brave or independent either. I do remember thinking that I could die, but the notion seemed acceptable. I was a part of the mountain, and in a weird way, the best way I can describe, I just existed. After a time I stood up, reached out my hand for the next tree, and took a careful step. I could see nothing as I moved on this extreme descent through trees, brush, and ice. And I swear to you, something or someone took my hand and guided me to safety, to the path, to the village below, to a family’s kindness, to my apartment in Vienna, and eventually home to my mother and sister, to the beach, to the warm sun, and to that Piscean bathwater, the Gulf of Mexico. My college class assessed the story. Some thought God himself guided me down, while others thought it was a guardian angel, or maybe an ancestor. Someone suggested it was my parents, protecting me with their love, concentrating on my safety, worried because they really had no idea how to find me. Today I don’t know what it was for sure (perhaps a mild concussion! ), but any of these things seem viable to me, a dreamy and careless Piscean, who casually set off to find ancient ghosts on the day of my twenty-first birthday and ended up pondering existentialism while hugging a mountain. One summer many years later I took George to Hallstatt. We rode the tram to the top of the Salt Mountain and descended the path back to town. We saw no signs pointing to ancient graves, and I could not find that place where I ventured from the path. I told George the story as we walked, and he listened without skepticism and, thank God, still married me, a product of his own Piscean mysticism, no doubt. 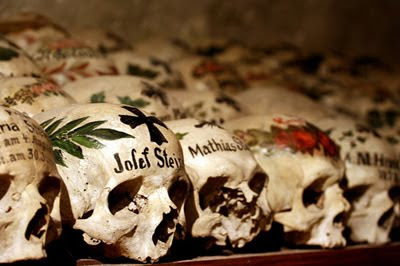 Even better, he discovered his own graves alongside the town’s Gothic parish church (c. 1450), where in addition to beautiful tombstones, the grotto holds thousands of neatly stacked skulls and other bones, dating back to the twelfth century, many painted with bright patterns and flowers. Eventually this fascination lead to hundreds of paintings with graves and tombstones. 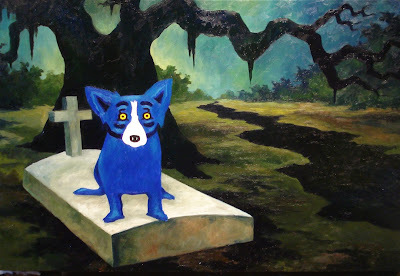 The recent series Bodies began with a birthday weekend several years ago when we spent two days visiting New Orleans cemeteries, staging photographs amidst the aboveground tombs. I remember you sharing that story with me soon after you returned from Austria. You were awestruck by your experience, and I remember thinking at the time that it had changed you...for the better! Happy birthday, dear friend!